I spent my last weekend at KL, shooting some stuff when I came across this set up. Smacked right there at the middle KLCC, with busy people walking right pass. Oh dear! 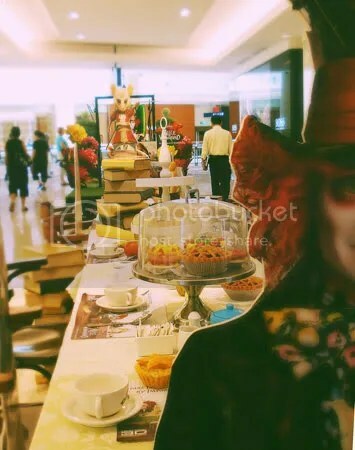 Its a TeaParty of Alice and MadHatter. Completed with darling cupcakes, hot tea, soft scones and all. How sweet!! And that sets me thinking, how about an Engagement Shoot in the theme of a TeaParty?? Won’t that be so whimsical? So delightful? Most importantly, different from the usual flower-holding-couples? Sure its difficult to set up a table in the middle of a lawn, but the results would be OH SO GOOD! Pss, you get to have a real tea party too.. I got back to Singapore, and did a search. See what I found..
Arent they the SWEETEST!? Such a dreamy shoot.. Of course we can modify it slightly, your groom doesnt have to be mad. He can be in a suit or vest. How romantic…. So have I convinced anyone? This entry was posted on March 25, 2010 by ohdearphotography. It was filed under Inspirations .